I’m just coming back home from a few days in a log cabin outside Gatlinburg, Tennessee. Ever been there? Who am I kidding? I’ve known this all along…I’m not exactly an outdoorsy girl. It was a great trip, nonetheless. Due to the lack of connectivity, I used the past few days as a “digital detox” of sorts…catching up on some reading, doing a little phase(two)learning brainstorming, and enjoying a few days of peace and quiet. Monday evening, we were thinking about where to get dinner. We decided to turn our decision over to the Yelp community to try a good, local place with good reviews. We stumbled upon this BBQ place that was, conveniently, just minutes from our cabin. The ratings were overwhelmingly positive and prices appeared to be reasonable (not always the case in a vacation spot!). On more than one review, it was stated that this place was a “hole in the wall” – but it was worth giving a try. We drove to the address and found an old, run-down house-turned-restaurant. It was, indeed, sketchy. But the intoxicating smell of BBQ wafting from the place lulled us into submission; we shrugged our shoulders and walked in. Am I glad we did. This place – despite the rough appearance – was legit. Delish. So this experience naturally got me thinking about how these folks are experts at what they do. They know BBQ. Would I ask them to facilitate a workshop for my team? Probably not – unless it was a cooking demo on how to make some killer pulled pork. But would I recommend them to future travelers who are in the area? You betcha – I’ll be adding a review on Yelp. Whether you’re at work or outside work, strive to learn WHY things are the way they are. It’s not enough to know a lot of “stuff” – you need to surround the “stuff” with understanding the bigger picture. A good way to start is by having a simple conversation with your manager – learn how decisions are made for your team. Learn how you can better support your boss, your team and your organization. Let “asking why” spill over to your partnerships – when completing needs analysis, developing content or while facilitating. Let asking WHY be your gateway to gaining context. 2) Learn something every day. There is a lot of talk about being a “lifelong learner” – and I think people define that in different ways. Whatever this means to you, embrace it. Maybe you’re pursuing a degree. Maybe you are involved with a local or national organization, like ASTD (ATD) or SHRM. Maybe you follow like-minded people on social media and have a strong Personal Learning Network (PLN). Maybe you follow this little blog (thank you!). Whatever works for you – do it. Learn from it. Put it into practice. 3) Spend time with the greats. I’d be willing to bet that the guy who made the BBQ at the Hungry Bear BBQ didn’t just wake up one day and decide to start making BBQ. He probably learned it from someone – whether a family recipe, or if he took over from someone else at the restaurant. Who is the expert you’d like to learn from? Is it your boss or a leader in your company? An industry leader? Someone in your community? Whoever it is, reach out. Even if you’re not seeking a formal “mentor” relationship, you can certainly ask that person to join you for lunch or to grab a cup of coffee. Learn their story – how did they get where they are? What have they learned along the way? What pearls of wisdom might they share? (Bonus: refer to Strategy #1 and ask them WHY.) You never know what you might learn by building deeper connections to interesting, intelligent people. All of this to say, it takes effort to get really, really good at what you do. Malcolm Gladwell has famously stated in his book, Outliers, that it takes roughly 10,000 hours of practice to truly master a skill. In our world, no one is going to become a master trainer/facilitator overnight. It takes years and a number of different actions to achieve “expert” status…and even then, there is always. more. to. learn. in our business. Trends emerge. Projects come along that challenge us. Take advantage of them to learn and move forward in your role and career. After all, if people were to start rating trainers, instructional designers, HR professionals and workshop facilitators on Yelp, how would you want to be rated? Your turn: One simple question…what do you do to continually develop yourself and sharpen your skills? Share your own strategies in the comments below! Know of a learning professional who would enjoy this post? Be kind and share it! Check out the Free Resources page for handy job aids, checklists and more! Great post and tips! 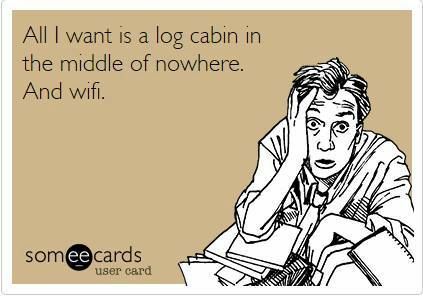 I totally relate to the log cabin with wifi! While reading this, I thought about the session I taught last night, and what made it successful. The things you mentioned were certainly part of it, and I have been doing this long enough to know that there is still a lot I don’t know. :o) Ultimately, it came down to observations. I am working with the leadership team at a water park, so I took some time to experience the park as a guest (tough gig, I know!). But that gave me lots of material to include in the presentation that made it VERY specific to the audience, showed that I cared enough about their product to experience it, and gave me ultimate credibility because I had “been there.” I don’t know how many people I have seen present who do the same canned presentation to every audience… that would drive me nuts. So to specifically answer your question, I sharpen my skills by finding new ways to relate to my clients. That brings about more interesting discussions, opportunities to ask why, and a better understanding of how I can serve them (and future clients). Thanks, Matt! The water park gig is a rough one, indeed! ;) But you are absolutely right – being able to experience the park as a guest does give you a perspective that allows you to speak their language and, like you said, relate to them. Great example!